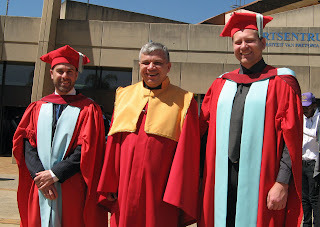 Three of my students completed their PhD degrees over the last couple of months and were awarded the degrees yesterday. Unfortunately Wesley Brandi could not make it from the US to receive his degree in person, but Neil Croft and Wynand van Staden were present. Ah, there is something nice about these academic ceremonies that hark back to their roots in centuries past - a rare constant in a world where everything else is ephemeral. And yes, congratulations to the three of them for persevering!